Annapolis’ Own, Farrah Hall, America’s Top-Ranked Women’s Windsurfer, Will Compete at the Formula Windsurfing World Championships on March 21-27, Held on Lake Potrerillos, Argentina. We at Compass whole-heartedly support Farrah and her goals. Having come so close in her last campaign, I personally admire her competitiveness and her determination to achieve her dream of competing in the Olympics. She won’t give up. Farrah opened her competition year with two solid performances. At US Sailing’s Rolex Miami Olympic Classes Regatta at the end of January, she put in a solid performance to retain her number one American ranking. She also won the Women’s Formula Class Midwinters title earlier this month, a competition held at Merritt Island, Florida and sponsored by Calema Windsurfing. “Winning the Calema Midwinters title has been a goal of mine since I first competed there six years ago,” says Hall. Being the last Formula Class regatta before the Worlds, many international pro windsurfers attended the regatta to test their equipment before heading to Argentina. Hall, from Annapolis, MD, who has her sights set on representing her country at the 2012 Olympics in London, England in the one-design RS:X Class windsurfer, is enhancing her Olympic campaign to race in the Formula Class World Championship starting next week on a lake 50 kilometers from Mendoza, Argentina. She is not alone in this cross-training approach. The current Formula Class Women’s World Champion, Marta Hlavaty, is also a campaigning RS:X class windsurfer for the 2012 Olympic Games from Poland and will be defending her title in Argentina. 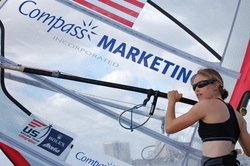 Compass Marketing, Inc., is the founding sponsor for Hall, who narrowly missed selection as the US women’s windsurfer at the 2008 Olympic Games in Beijing, China. Hall is also sponsored by KA Sails, an up and comer in the windsurfing industry. KA Sails helps make her Formula campaign possible. Hall’s schedule for the spring and summer includes the following events: Formula World Championships, Mendoza Argentina; French Olympic Week, Hyeres, France; Kiel Week, Kiel, Germany; Sail for Gold Regatta, Weymouth, UK; and the RS:X World Championships in Kerteminde, Denmark. Compass Marketing is the country’s leading marketing and sales company for consumer products. Compass Cares’ goal is to help many different types of people reach for their dreams, just as Farrah is, whether it is by working with JDRF, the United Way, Pathfinders for Autism, the International Foundation for Research and Education on Depression (iFred) or many others, Compass Cares brings together clients, customers, employees, family and friends to help make a difference.